Sometimes it happens that our guests ask why we usually do not set sails on our motor sailing boats. The answer is quite simple. As soon as an itinerary is published in the brochure or on the internet, we need to keep with this, as far as weather conditions will allow us to do so. Our guests deserve to visit the places which are described in the itinerary. Exactly this would hardly be possible if our captains did not use engine power. While the ship’s speed may reach seven or eight knots under power supply, under sails it would mostly be three or four knots only. Furthermore, you never know the direction and the speed of the wind in advance. Once it may be the Maestral from northwest, once the Burin from northeast, and once the Jugo from southeast… Several decades ago, our classic-style wooden vessels used to be pure sailing ships, they have been shipping wine and other goods from the mainland to the islands and from the islands to the mainland. However, over time, they have been adapted to the demands of modern tourism; they dispose of comfortable cabins and superstructures on deck, which prohibit real sailing. Moreover, even the modern vessels with steel hulls, modelled on the traditional motor sailing ships, are more or less small and comfortable cruisers, but not real sailing ships. However, they still exist – the “real” sailing ships. 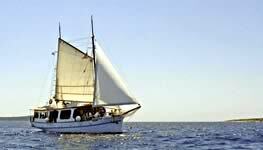 To meet the wishes of many of our regular guests, we offer pure sailing trips, at least at a couple of dates. Whenever the weather conditions allow it, we will set sails and the engine will be turned off. Of course, you are welcome to help the crew to set sails and to stand at the helm, under the supervision of the captain. Although we will not follow a strict itinerary, you may be certain that the captain will take you to the most beautiful coves and places of the Dalmatian islands. 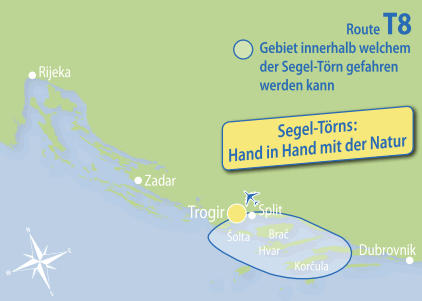 The islands of Šolta, Brač, and Hvar are on our schedule – and even the Pelješac Peninsula and the island of Korčula – provided that the winds are well-disposed towards us. Wait and see – according to the Dalmatian motto “kamo nas vitar nosi” (where the wind will take us).